As a powerful religious organisation, how do you react when a schism threatens to consume the beliefs and systems which maintain your power? This is the question that the Catholic Church set out to consider at the Council of Trent in the middle of the sixteenth century. The resolutions of the Council have been broadly referred to as the Counter-Reformation: a Catholic response to the Protestant movement sweeping across northern Europe. The response was multi-faceted, using politics, theology and culture to make a powerful statement about Catholic identity. The catacomb saints and the Baroque movement both emerged from this response, leveraging the Catholic Church’s exceptional history and wealth to make a claim of authority: Catholic Christianity was the only true Christianity. 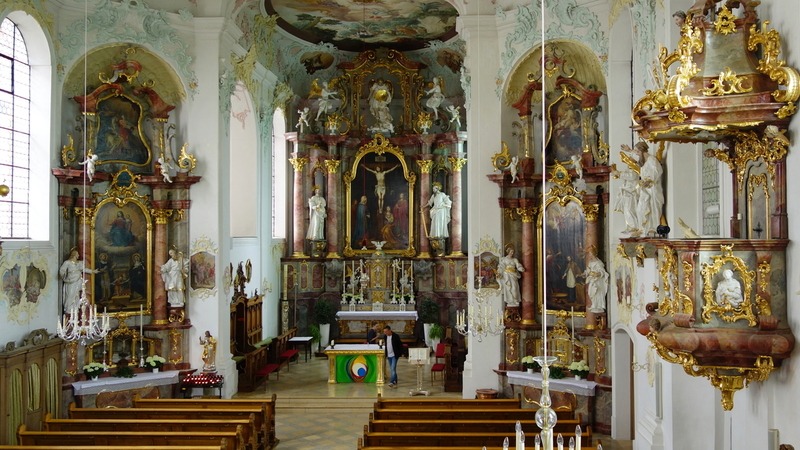 Notice how almost every surface of the church is decorated, with engraving, gold or statues. The effect envelops the visitor in the Christian story, which takes place everywhere you look. 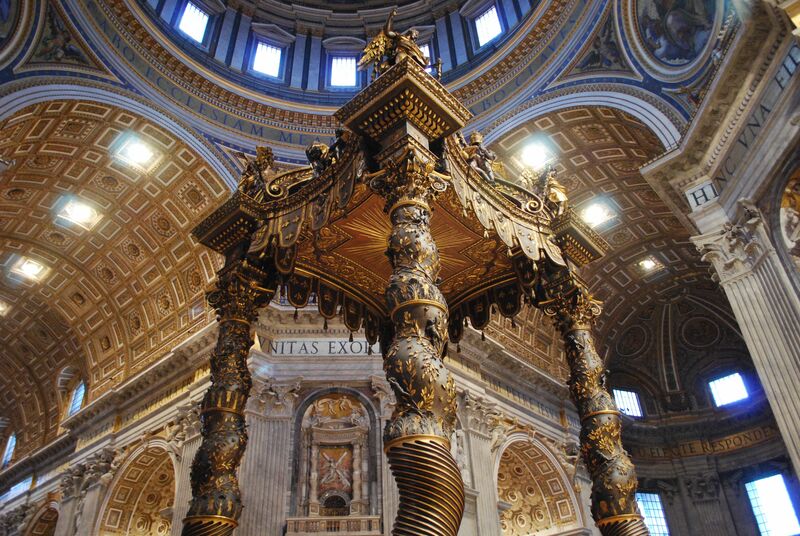 There are much more striking (and famous) examples of the Baroque, such as Bernini’s canopy in Rome, but the sheer excess of the style stands out dramatically when situated in tiny parish churches. I don’t like the Baroque very much, but just like the catacomb saints, it’s hard not to be awed by the scale of it all. 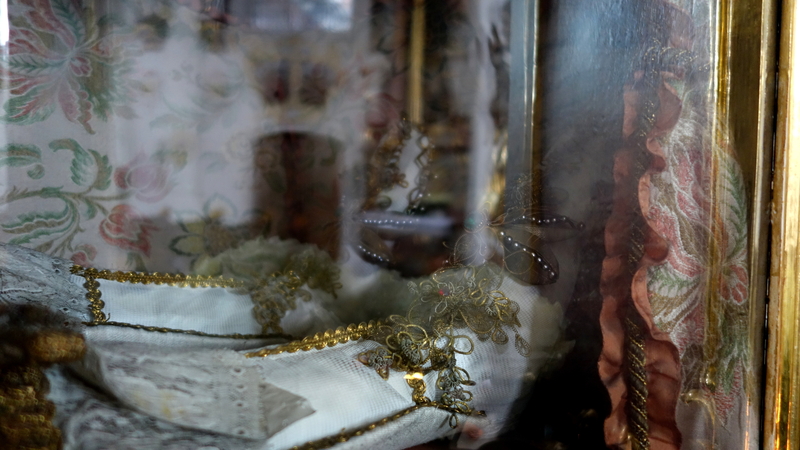 The catacomb saints are not a Baroque phenomenon, however: the importance of relics and their worship in Catholic culture significantly predates the Baroque. Yet it’s unsurprising that these over-the-top statements of Catholic identity arrived together, given the insecurity of the Church at the time. 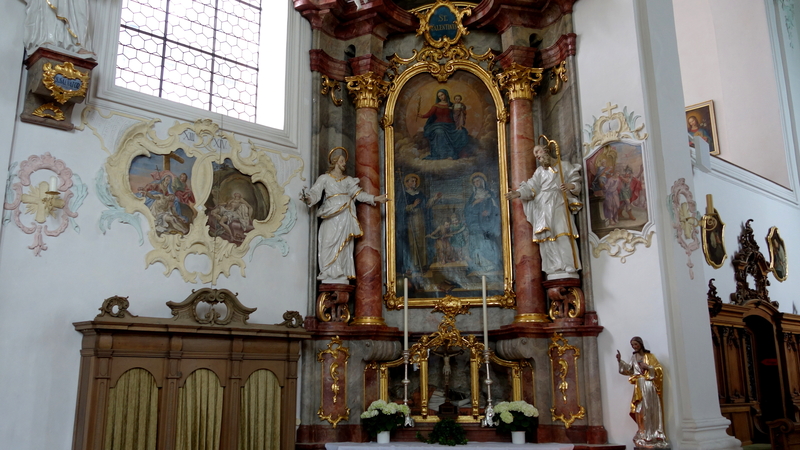 Valentinus arrived at Krumbach with a certificate of authenticity, which is now generally accepted to be fake. The names of the saints, as Koudounaris notes in his book, are generally related to traditional Christian virtues; Valentinus would not know himself by that name. The skeleton is probably just an average ancient Roman. 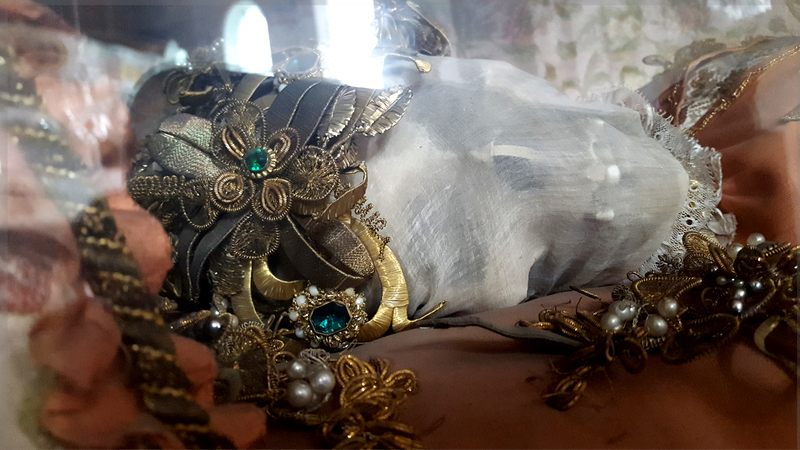 What a bizarre post-mortem career: to lie, heavily decorated, in a glass box in a sleepy Bavarian church! 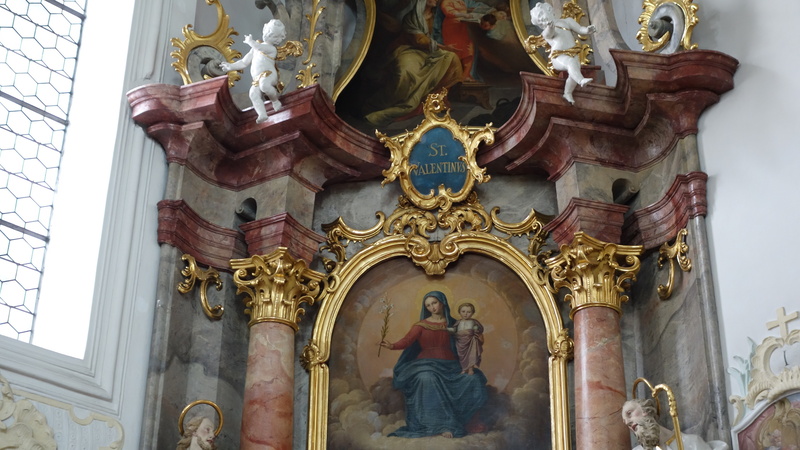 In Krumbach, we met the church organist, who told us that the saint at the church was generally accepted to be a ‘fake’. It was one of the questions which interested me most prior to our trip: how do you reconcile the modern knowledge that catacomb saints are almost certainly all fraudulent with the fact that they were once devoutly revered? How saintly can one become, in essence, by simply being cast in the role of a saint? Thousands of catacomb saints made their way across Europe, and many of them have been lost as a result of the realisation that they are of rather more common origin than was initially hoped. 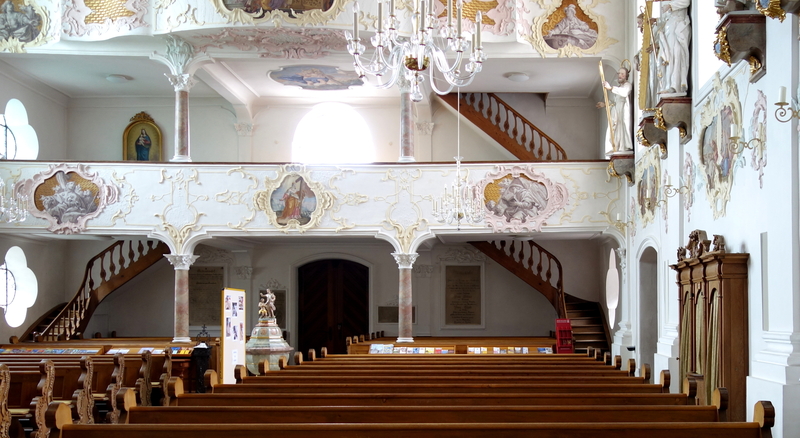 Those that remain, however, occupy a strange space between the sacred and the profane: as we would see in Munich, turning the skeletons into valued historical treasures whose sanctification has somehow occurred in the centuries between their disinternment and the present day.